What a lovely family! Happy to see one of your posts. Great reasons to slow down! Miss your videos but I'm happy to see you're still around! What a treat to see your post pop up this morning. I am not quite to where you are in your scrapbooking journey, but after a very long conversation by phone with my sister-law/best scrapping pal on this very subject yesterday, I think she and I are coming to that same place. It is fun to have lots of experiences that evolve how we scrapbook, but now we are to the place where we know what works for us and we want to power through lots of photo stories. I will be watching for more details on each of your steps. 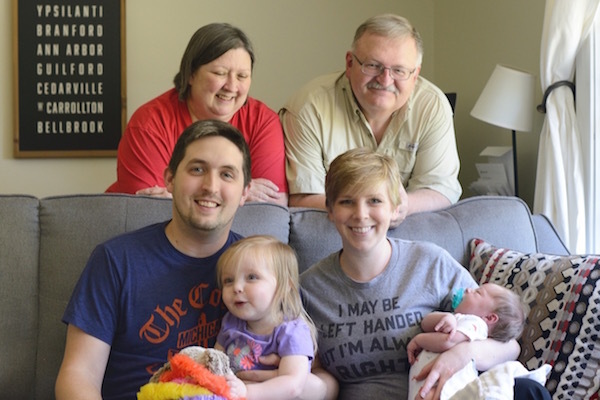 And I am betting you'll be sharing more layouts featuring those adorable grandkiddos too. Can't wait. So happy to see your post! I love, love, love Scrap Gals and like you really enjoyed the new rules episode. Still a relatively new scrapbooker so I'm still figuring things out. But the podcast really did was the guilt I feel sometimes of not being prolific enough to get all the stories running through my head translated into pages in the album. I'm looking forward to seeing more of you process as it has always seemed like my intuitive style is so much like yours. And congrats on the growing family! They are beautiful! So FUN to see this post and your beautiful family! Of course, that's a great reason to be scrapping less - making memories with those grandbabies! Thanks for your post and all the good information in it!! Lovely photo of your family! I'm going through podcast withdrawal so I'm looking forward to hearing this. Wow! This is an interesting post. The rules you have described are essay to perosnlize the process. The Family photogrpah is awsome. Thank you for sharing this post.